HomeOffice Plants Tips & IdeasHow often do my tropical office plants need maintenance? How often do my tropical office plants need maintenance? 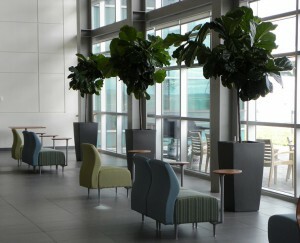 You have decided to enhance your office environment with tropical plants (Btw… brilliant idea. See our post October 2!). Now how do you keep the plants looking great for years to come? Make sure that your interior landscape contractor provides maintenance once per week. There is currently a trend in the industry towards bi-monthly maintenance; the technician gives the plants lots of water with the hopes of getting the plant through the next two weeks until the next maintenance visit. With the exception of a few types of plants, this usually results in droopy plants and yellow leaves. This is a particular problem in the winter when the air in the office buildings become very dry as a result of the heating systems. Most of the moisture in the soil quickly evaporates into the air. Weekly visits allow us to react quickly to any changes in the office climate and make the adjustments to the amount of water we give the plants. As you well know, one day it is incredibly hot in your office, the next you are freezing. The plants react to this as well, and if we are there every week, we can see the effect on the plants and react accordingly. We know this works. We receive numerous calls every month from clients who have been switched by their service provider to bi-monthly maintenance and are unhappy with the way their office plants look for most of the two weeks between service calls. We strongly feel that if you are going to have plants in your office, they need to look good every day! Yes there may be (not always though) a small difference in the cost of the maintenance, but it is usually minimal. In addition to the health benefits to the plants, we have found over the 25 years we have been in business that our clients look forward to our visits. We have built strong relationships with our long-term customers and I know it has much to do with us being such a familiar part of the office culture. In addition, studies have shown that people feel better about their employment situation when they see that their environment is cared for regularly.